I'm currently in Los Angeles for 6 weeks working on a couple of exciting things, replenishing my inspiration levels, meeting with interesting people, and taking a much-needed break on the side. This enormous city is brimming with incredible places to eat, and I usually find myself basing my day around where I want to feast. Cooking at home is totally irrelevant for me in LA. I've received a number of messages from people asking me to create an LA must-visit guide, so here goes! (It's not all about food, but...well, it kinda is). My day always begins with a matcha latte with almond milk from Matcha Bar. If it's a hot day I'll go for an iced version, or if it's chilly I'll get a hot one - either way it's completely delicious and provides me with the perfect little energy kick needed to have a productive day. I am a total creature of habit, and when I find something I love, I tend to stick to it. Hence, this is the breakfast I get most days here in LA, from the wonderful Honey Hi. This particular dish changes with the seasons, but currently, it's called 'That Grain Bowl' - it's off the charts delicious, well balanced, nourishing and basically just all I ever want to eat. I can't use many words to describe Jon and Vinny's other than perfection. I can hands down say it is the best Italian food I've ever had anywhere in the world. Try and sit at the counter so you can see the chefs cooking; it's a sight to behold. Sqirl is a lunch spot I go back to time and time again. There's always a long line, but you don't really care when you know what's about to be served to you. Again, the creature of habit thing, I always go for the same 2 dishes - the smoked white fish tartine, and the crispy rice tabouleh. Seriously to die for. 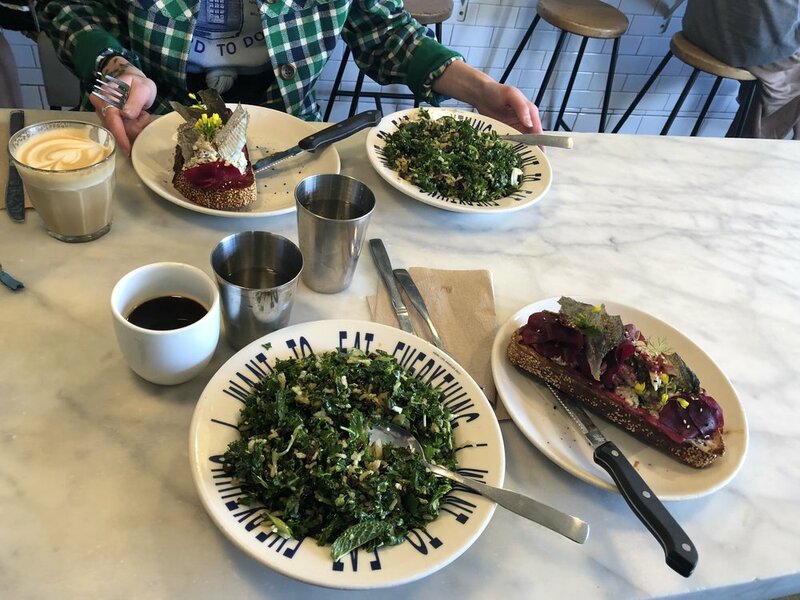 Oh, and excuse the bad photo, but this is what I always get for dessert from Sqirl - an enormous thick slice of toasted brioche, slathered with almond butter and smothered with house-made jam. Honestly, it's almost too delicious. Gjusta is another eatery which I hold very close to my heart. It's all the way in Venice though so I don't go often, but when I do, it's a meal that I think about for days afterwards. This cheeseburger was hugely noteworthy, as are all of their sandwiches and salads. What makes it all so good is the bread (it's not that easy to find good bread in America), but the Gjusta bakery know exactly what they are doing, and it's heavenly. My latest meal at Gjusta - a selection of salads and a slab of perfectly grilled salmon. If you're in America, it's gonna be pretty hard to avoid pizza. I've had it on 5 separate occasions in the space of 3 weeks. Pizzanista sits at the top of my pizza list (bar Jon and Vinny's which is so much more than just pizza) because it's a casual place with a great atmosphere, cool staff, and very very good pizza (weirdly known here as 'pie') by the slice. Sometimes only doughnuts and pastries will do, so it's worth getting the best if you're gonna give in to the cravings. Head to Mr Holmes Bakehouse for just that. 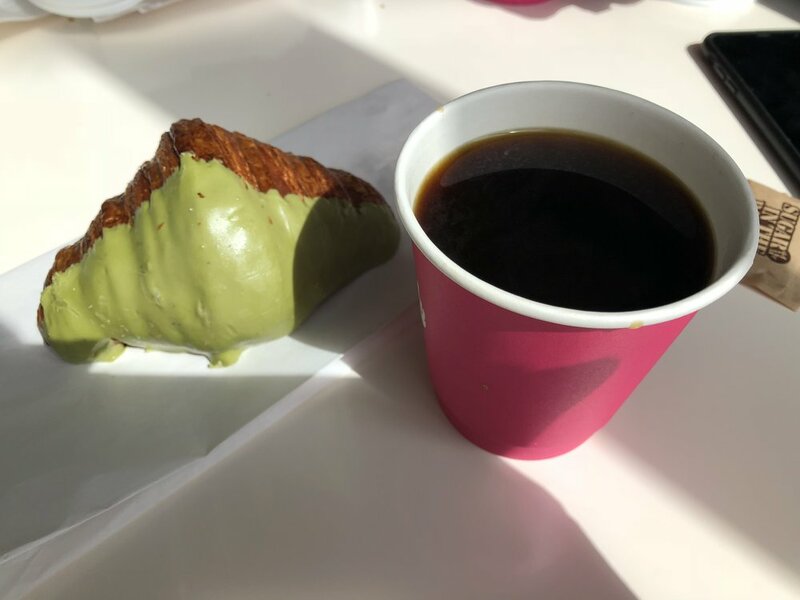 When I went I missed out on the famous cruffins, but this matcha dipped croissant was insane, as was the creme brulee one. So I don't have a photo of any food from Night Market, probably because we waited too long to get a table and then the food was too good that I couldn't be bothered. I did, however, keep our fortune cookie fortunes, and maybe you can tell by the tablecloth what sort of restaurant this is. It's incredibly delicious, Northern Thai street food is what it is (the fried chicken sandwich is definitely a meal to write home about). Perhaps that's enough about food now. Although there is great food at Highland Park Bowl. This is the oldest bowling alley in LA (est. 1927), but it's been beautifully restored and now serves boujee cocktails to people like me and my friends. If you like tenpin bowling I highly suggest you check it out. The Rose Bowl Markets only happen on the second Saturday of each month and thank god for that because this place got me so overwhelmed - in the best possible way. Throw away any notions of flea markets you may have, as this one is on an entirely new level of its own. Don't come unless you're well fed and well caffeinated. And finally, one of my favourite places to get a drink, see a band, and of course hop in the photo booth is Cha Cha Lounge. This classic dive bar is the epitome of LA, and I've seen some amazingly dressed people here. In case you don't already know, dive bars like this free pour spirits, and the shots are the size of a cup of tea, so just watch yourself!